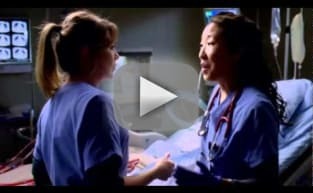 Watch Grey's Anatomy Season 7 full episodes online, free and paid options via our partners and affiliates. Meredith's dishonesty in the clinical trial comes to light, leading to unanticipated consequences for both her and others on the Grey's Anatomy Season 7 finale. Personal and work pressures are adding up and have Meredith visibly on edge, Owen conducts formal interviews for the Chief Resident position, Cristina grows increasingly defiant. The May 5 episode of Grey's Anatomy features Callie and Arizona's wedding. It should be a magical affair ... but where are Mer and Der? "It's a Long Way Back"
In this week's episode, Callie worked hard to recover from her accident so that she could care for new baby. In an effort to help the Chief's wife, Meredith risked Derek's Alzheimer's trial. Alex successfully started a project to help African children in an attempt to when the position of chief resident. The long-awaited Grey's Anatomy music event. "Song Beneath The Song" will showcase the pipes of Sara Ramirez like never before. With his wife's health failing, Richard is desperate for Derek and Meredith to accept Adele into their Alzheimer's trial, but will Adele stand in her own way? Meredith must choose between fertility treatments and eyesight when she begins having trouble seeing. Mark makes it clear to Callie and Arizona that he takes his role seriously. Meredith, looking to prove she is Chief Resident material, learns that anything and everything can happen in an hour's time when she steps up to run the ER for a night. Thatcher Grey, Meredith and Lexie's father, returns to Seattle Grace with stomach pains and a new, twenty-something tattooed girlfriend, Danielle. "Don't Deceive Me (Please Don't Go)"
Derek breaks ground on his Alzheimer's clinical trial and Meredith can't help but feel left out. Bailey's attempt to take the hospital into the age of new media with live tweets from the OR does not go over well with the Chief. Callie, Mark and Arizona must learn to navigate through the pregnancy together. Arizona tries to reconcile with Callie, who has big news to share. Teddy faces an important decision; the residents receive new interns; the Chief makes an announcement. News of the incoming mass causalities after a gunman opens fire at a local college hits the staff hard when they must spring into action, even while their own wounds are still fresh. Despite Meredith's objections, Derek takes Cristina on a fishing trip in order to get away from it all. Teddy directs all her efforts towards a dying patient who lacks insurance to seek medical treatment. Derek lands the grant he needs for his clinical trial, but a surprise visitor shakes up the celebration at Joe's. Meredith and Alex have to fend for themselves during the night shift. Top security measures go into place as the team treats a major political figure from the Middle East. Cristina throws a housewarming party. Alex shows up late from a weekend getaway to his first day of rounds with the new Pediatrics Attending. The residents are pushed to their limits when Owen puts them through a rigorous trauma drill; Cristina is tested when left alone to monitor a lung transplant patient. A documentary film crew visits the hospital six months after the shooting to document the road to recovery for doctors and patients. What follows is a trip down memory lane, and not in a good way. Chandra Wilson (Bailey) makes her second directorial mark on Grey's Anatomy in this episode, the fifth of the seventh season. A visit to the obstetrician results in some disturbing news for Meredith and Derek. Lexie loses it when she notices Meredith and April getting closer. Derek receives an unexpected and unwelcome visit from his estranged sister, Amelia, and issues between the siblings - both past and present - surface in the latest Private Practice crossover event. Meredith tells Derek about the miscarriage and is cleared to return to surgery. Cristina experiences PTSD at a really bad time, and Bailey refuses to let Alex operate. "With You I'm Born Again"
The staff tries to return to normal after the event that concluded season six. A trauma counselor is brought in to help everyone do so, as Derek makes a spontaneous decision. If you can think of a reason; any reason at all why the universe is so screwed up and random and mean; now would be an amazingly good time to tell me because I really need some answers.